• Gather general knowledge about the world. Learn different historical, cultural & traditional facts of the unknown lands & its people. Gather material for projects & researches on any topic of your interest using the collection of Educational CDs. This is one further step to make the RDM a perfect “Global Village”. 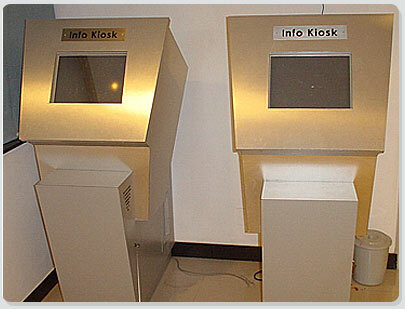 Info Kiosks are touch screen computers with the world full of information. At the RDM we have some 10 Info Kiosks placed to make this Museum technologically rich and easy to use. • Find business opportunities across world. • Play you’re the National Anthems of your Country. • Anything from National Flags to Languages of the Countries. • History and Culture of Countries. • Locate a city, region, state, country or continent. • And locate your favorite doll too!! ……… So very easy for children and adults both. !!! We know the unique culture, tradition, ethnic features of various parts of world through this graphic & textual display of information of stands by each showcase. This is a unique feature of the museum becomes a one-stop source to understand & appreciate different culture and boost the spirit of international brotherhood. Educational CDs ranging from National Geographic, Discovery, Encarta, Encyclopedia etc. • Foreign & Indian Language CDs of over 60 languages. Children stories, fables, folk & fairy tales etc – a collection of over 100 CDs in English, Hindi & Gujarati.